Cranberry Chocolate Cake is the answer to your last minute holiday baking issues. Issues is putting it mildly around here. Prior to making this cake last night, I’d done NO baking. None. Nada. Zip. Zilch. Not a Christmas cookie in sight. Completely pathetic. 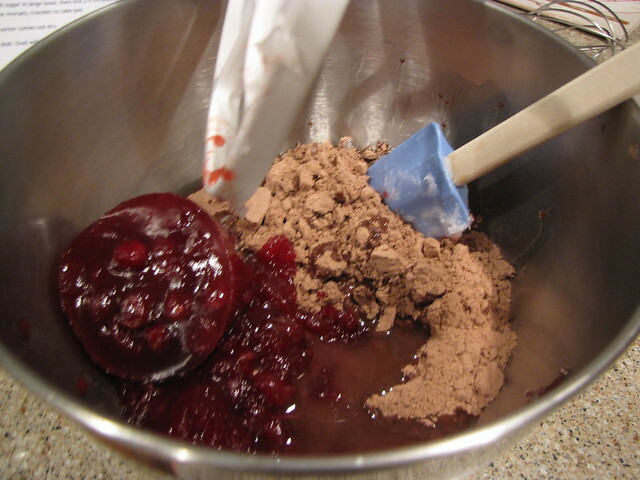 So when my friend Roz gave me this recipe and I saw cranberries and chocolate, I knew it had to happen ASAP. The fact that this starts with a cake mix is something for which I don’t feel the slightest need to apologize. There is a time and place for baking completely from scratch. There is also a time and place for knowing a good thing when you see it and taking the less stressful road. This cake is moist, delicious, tangy, and packing a major chocolate punch. Just what the holidays call for. 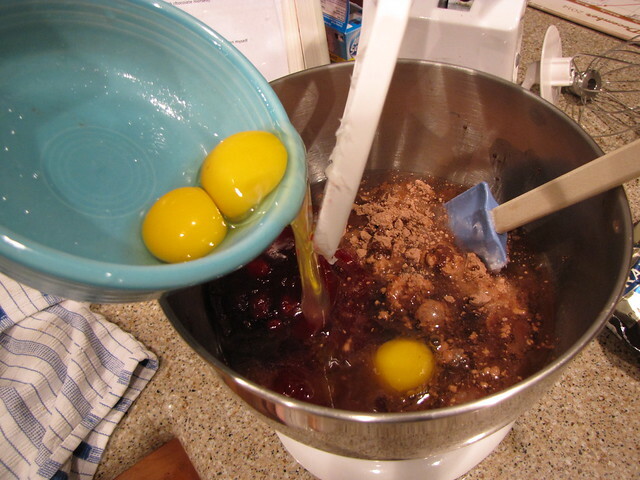 Devil’s Food Cake Mix, Whole Berry Cranberry Sauce, Coconut Oil (or Vegetable Oil), Water, Eggs, Orange Extract, and Bittersweet Chocolate Chips. Powdered Sugar is optional for a garnish. Also recommended is vanilla ice cream or whipped cream. 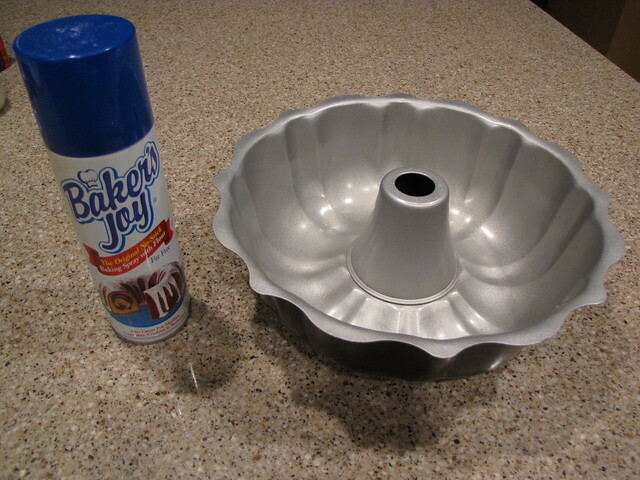 You will also need a bundt pan and either baking spray with flour like Baker’s Joy or Butter/Crisco & flour for preparing the pan. I don’t use a ton of cooking spray but Baker’s Joy is the real deal. 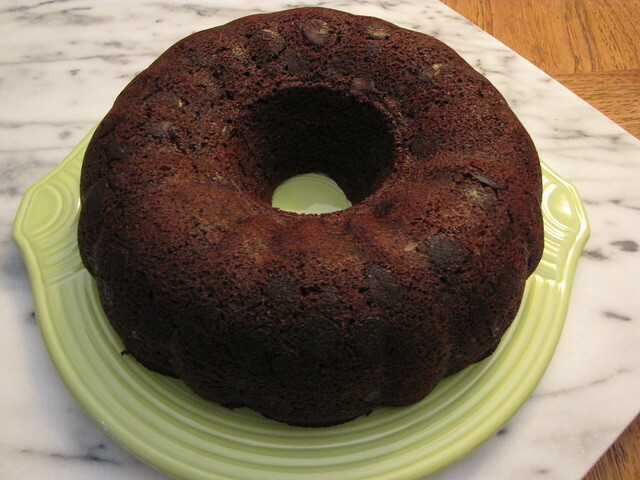 It makes greasing all those nooks and crannies of the bundt pan extremely easy. Spray your pan thoroughly being sure to include the tube in the middle. If you are going old school with butter or crisco and flour, take your time and be SURE you get every surface oiled and floured well or your cake will stick. To save time I made this in my big mixer. However you could also use a little elbow grease, a big bowl, and a sturdy whisk. 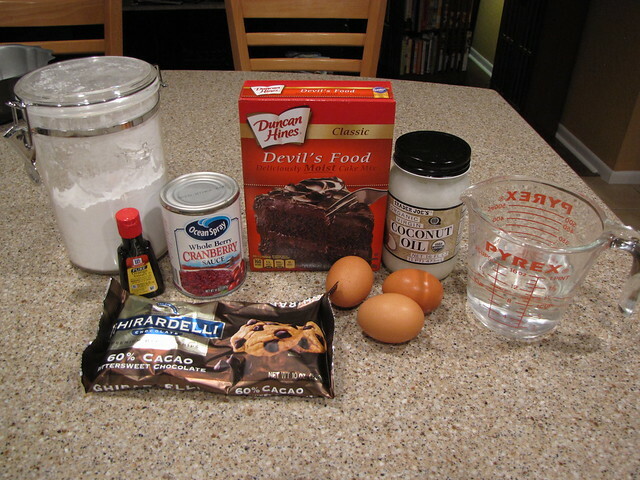 Dump the cake mix into the mixing bowl and add 1¼ cups water. I’m using ½ cup of coconut oil that I have microwaved for about 20 seconds to liquify. You could also substitute canola or vegetable oil. 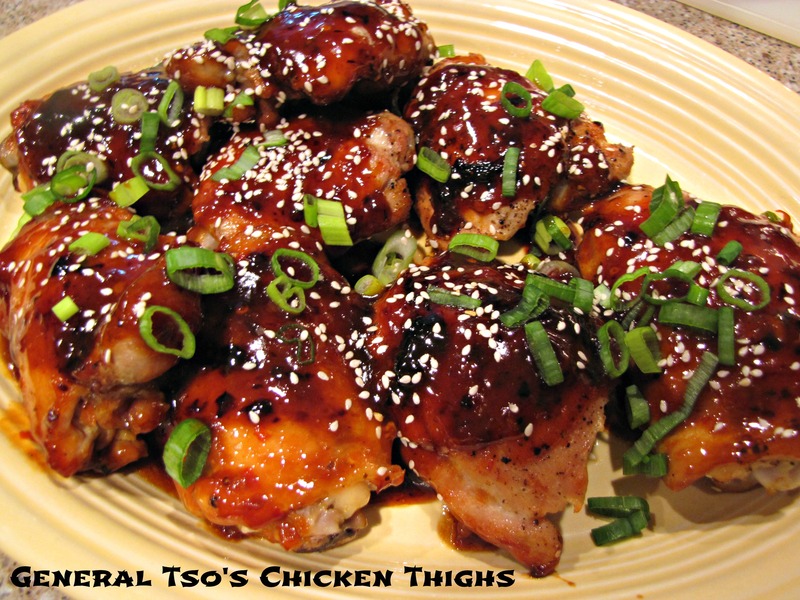 The coconut oil adds a little extra flavor so if you have that in the pantry, I would recommend using it. Dump in 1 (14 oz.) can of whole berry cranberry sauce. Be sure to buy the sauce with the whole berries and not the jelly kind. Add 3 eggs and ¼ teaspoon of orange extract. I think the orange extract is the secret ingredient that makes this cake extra tasty. 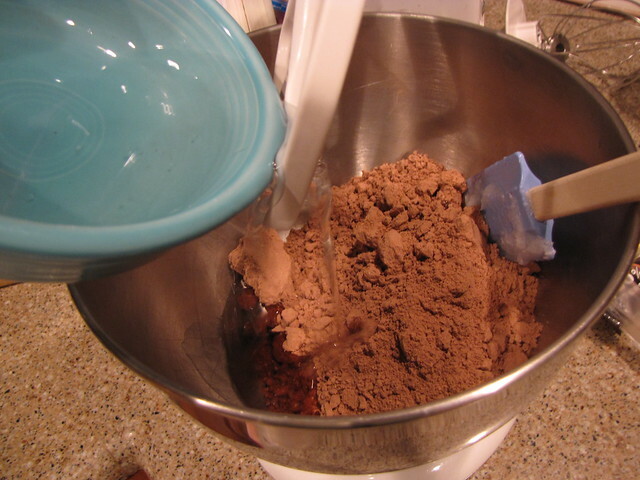 Turn on your mixer and beat at medium speed for 2-3 minutes until the batter is smooth and well blended. 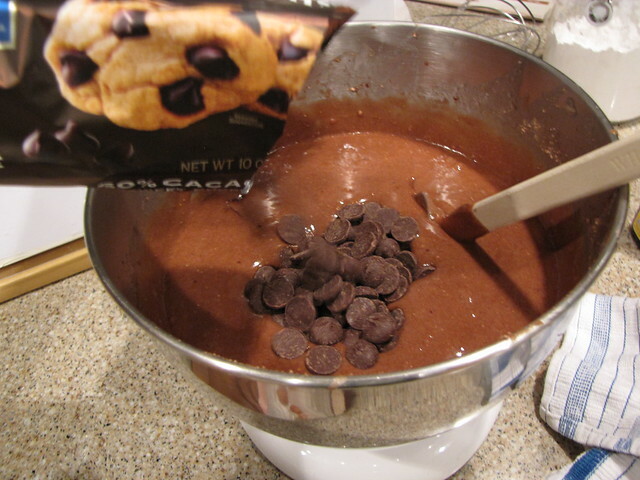 Add 1 cup (or more) of bittersweet chocolate chips. I had most of a 10 ounce bag and just tossed them all in. As usual, I’m using my favorite Ghirardelli Bittersweet chips. They’re bigger than regular chips and have rich chocolate flavor without being waxy. 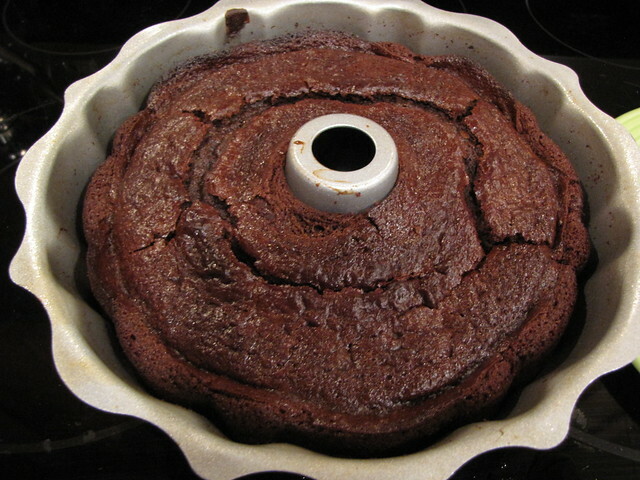 Stir the chips into the batter then pour it into your sprayed (or greased and floured) bundt pan. Bake at 350 degrees for 35-40 minutes or until a toothpick inserted into the center of the cake comes out clean and mostly dry. 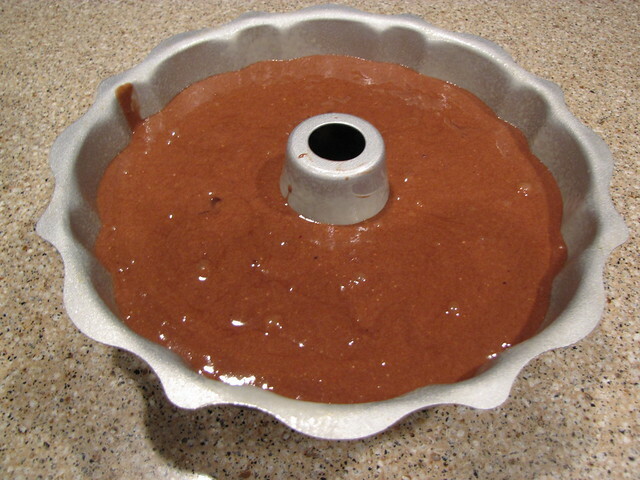 Let the cake cool in the pan for 10-15 minutes. Just to give my cake a little extra help out of the pan, I carefully run a small knife around the middle tube part of the pan. 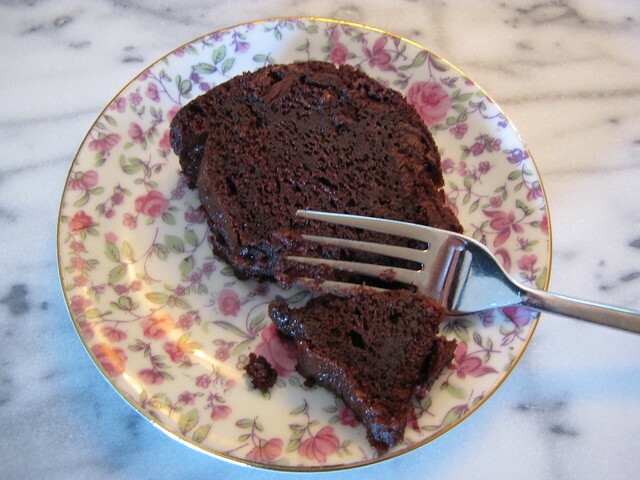 Put a plate, cake stand, or serving platter on top of the cake then invert it to unmold. If you’ve done your due diligence greasing or spraying the pan, the cake should slip right out. Once the cake has cooled, you can sprinkle some powdered sugar through a small strainer over the top for that “just snowed” look. Or you can dig right in. To tell you a little about how amazingly good this cake is, I who no longer eat wheat, ate almost that entire piece before I could stop myself. I’ll definitely be working on a gluten free version of this one for next Christmas. The other day as I went into the orchestra pit for The Nutcracker, my friend Roz who plays the harp stopped me to tell me about this cake. One of her harp students had made it for her as a gift and she was describing the cake and the beautiful and thoughtful presentation from her student, I asked for the recipe. Not even 24 hours later, it was in my email inbox complete with the photo below. 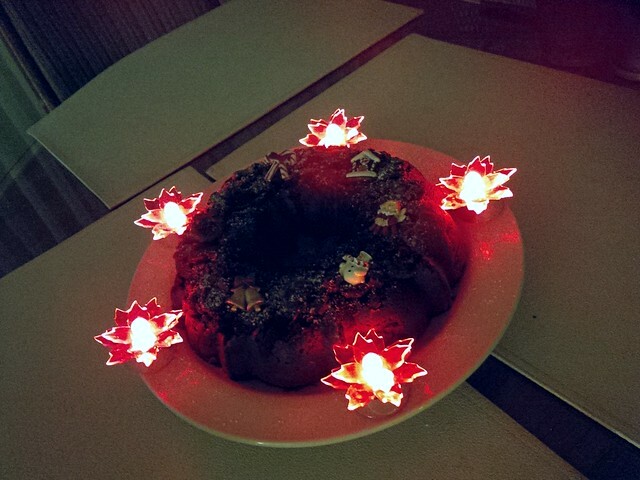 Sadly, I could not find those cool poinsettia tea lights (I tried!) but I’m so grateful to have good friends who pass on good recipes. Many thanks to Roz Beck and especially to her student, Cynthia Tutera for bringing Christmas cheer (and chocolate) to my kitchen! 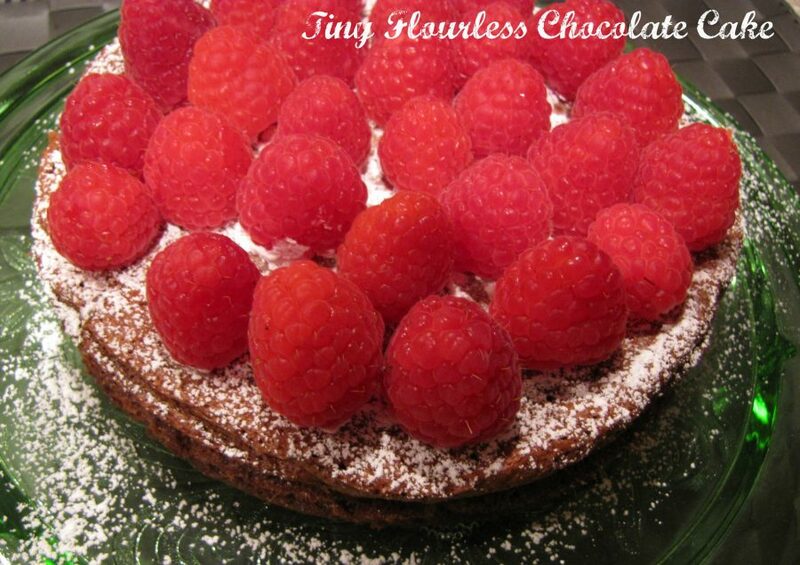 This looks great – I just may have to figure out a way to make this minus the box cake. I know I’m going to have more cranberry sauce than I need after making a batch for Christmas and I’ll bet it would work just fine to do a version of this. That solves my surplus cranberry problem! And in cake form – awesome! I’m sure you could adapt any good chocolate cake recipe pretty easily. Let me know if you do! Claudia– Outstanding job!! The cake looks absolutely perfect. So glad you liked it! 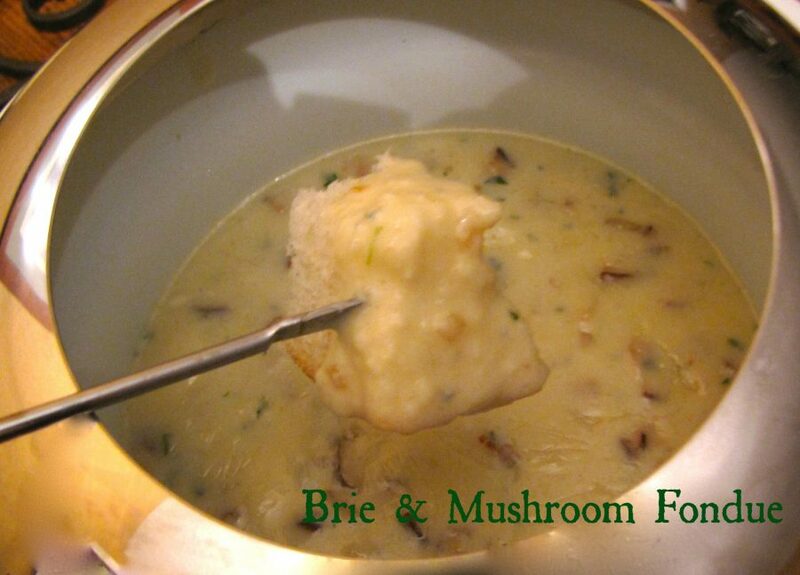 Many thanks for all your delicious recipes this past year. We’ll look forward to more in 2015!! Best wishes for the happiest holidays ever! So good to see somethin’ from the oven at IK. I know…the whole not eating wheat thing really cuts down on the baking fun. More cake coming soon! So, I know the holidays are technically over now, but I’m pretty sure I need this cake in my life, like, immediately. Thanks for sharing! I’m not a big fan of cake, but this ONE spoke to me!!!!! I’ll give it a whirl when our ‘next event that needs a cake’ arises! Love those lights too!! My pantry is nearly bare, and I have no grocery money. I looked my cupboard and saw Duncan Hines Devil’s Food cake mix, and whole berry cranberry sauce, and thought, “I wonder if I can put those together somehow?” So I googled ‘chocolate cake mix and cranberry sauce’. This was one of the first results. I have everything except the eggs (even the orange extract). I do have meringue powder, that can be used as an egg white substitute, so I think I’m going to attempt this recipe using my meringue powder. Thank you for the inspiration! Oh boy…we’ve all been there. Hope it turned out! 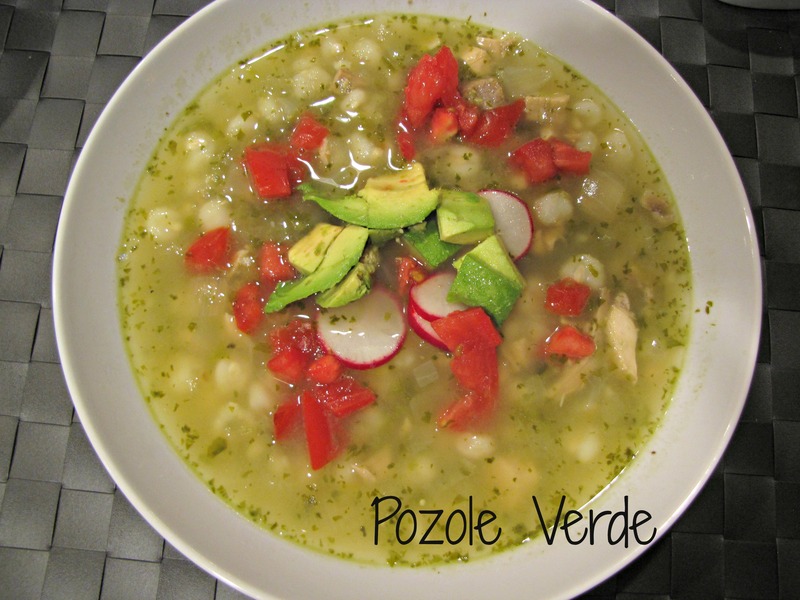 I wonder if I can make this with whoel cranberries instead of canned sauce? I have a bag leftover from Thanksgiving and wanted to use it in a cake mix.